We are delighted to announce a new three-year partnership with Durham County Cricket Club. We will continue to act on the club’s behalf with regards to legal matters, vital expertise and strategic business advice. After a mutually successful partnership between ourselves over a number of previous seasons, we will again work together in the coming years. David Harker, Durham CCC Chief Executive, said: “Muckle are a vital and valued legal partner and we are delighted to renew our partnership for another three years. Stephen McNicol, Client and Strategic Development Partner, Muckle LLP said, “We are delighted to continue our long term relationship with Durham CCC and by signing this new three year partnership we are committing to the exciting new era for the club and the communities and businesses in the region it unites. 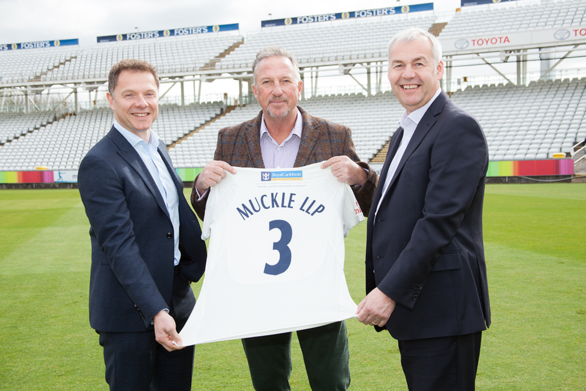 Durham CCC Chairman, Sir Ian Botham, said, “This is fantastic news that a leading North East business like Muckle has committed to support our club for a further three years. This is testament to the recent progress we have made off the field and the new direction and atmosphere we are beginning to create around the club. As sole legal partner of Durham CCC the sponsorship agreement will see Muckle branding appear prominently across the Riverside stadium including the pavilion, perimeter advertising boards and hospitality area. Muckle branding will also feature on the Durham website and as part of joint promotions and marketing activity. Our Corporate team has ranked number one in the North East’s Experian top dealmaker league for the last three years and our Sports Division, who also advise the Caribbean Premier League (CPL Ltd.), were the only firm recently recognised in the Legal 500 rankings for sport in the North of England.